Ghostbusters II didn’t come anywhere close to living up to the original 1984 box office hit, but 30 years after its release, Playmobil’s revealed some new additions to its Ghostbusters line that somehow manage to improve the lackluster sequel—including a replica of Ecto-1A sporting some impressive detailing for a kids’ toy. 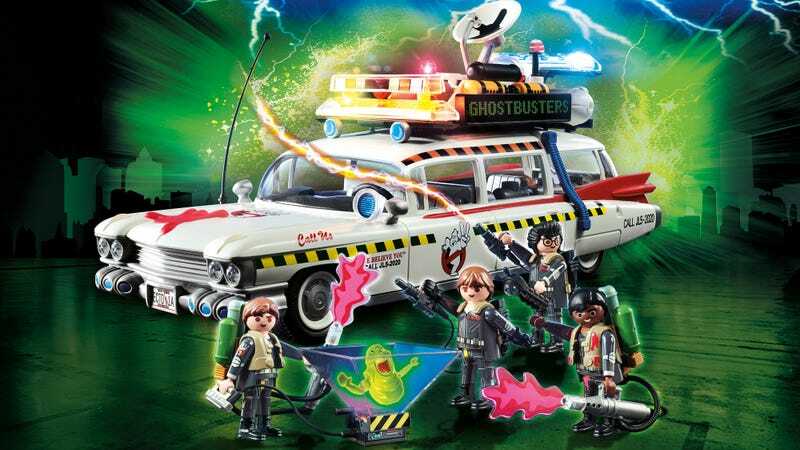 Back in early 2017, Playmobil revealed its collection of Ghostbusters sets, which was one of the first licensed themes for the toy company that’s been around since 1974. It included most of the characters from the original film (ghosts included) as well as an elaborate firehouse playset, and a lovely replica of Ecto-1 that, at just $45, rivaled more expensive replicas geared specifically toward collectors. Playmobil’s Ghostbusters II collection, timed to coincide with the 30th anniversary of the sequel, isn’t as expansive as the original, but it includes the one character most collectors actually care about: the upgraded Ecto-1A vehicle. Available sometime in May for $60, Ecto-1A is even more detailed than the original version, with more flashing lights and sounds (all powered by three AAA batteries) as well as glowing pixel boards advertising the team’s services. The set also comes with a bunch of ghost-fighting accessories, like proton packs, and the four Ghostbusters themselves, sporting their darker uniforms from the second film. If those updated duds aren’t doing it for you, Playmobil will also have a $20 Ghostbusters four-pack arriving in May with Ray, Peter, Winston, and Egon sporting their original light brown jumpsuits from the first film. Each figure also includes a wearable proton pack and various ghost-busting accessories like P.K.E. meters and ghost traps. Lastly, reminiscent of the Funko X Playmobil Ghostbusters six-inch figures released a few years ago, Playmobil is releasing its own super-sized versions of its Ghostbusters figures. Sporting their uniforms from the first film, these six-inch variations are not only taller than your standard claw-handed Playmobil figures, they also include more detailing, like the cargo pockets found on each figure’s pant legs, and the lacework on their boots. However, with a price tag of $50 when available come May, these are definitely more geared to collectors, as picking up all four will cost you 10 times what the smaller-scale four-pack costs. I ain’t afraid of no debt from my obsessions.